Welcome old man winter and thank you! The lovely thick blanket of snow you left for us made for a most luxurious morning in bed. Today was the one of those lazy mornings. One of those - I am staying in bed until nine o'clock mornings. The quiet of the morning's snow blanket kept my entire family snug in their beds, warm under their covers. When I finally said enough is enough, I must get out of bed, I crept into the kitchen and looked out our window at the beautiful bright white snow. I decided at that moment that it was my job to thank old man winter for this beautiful gift. It was settled. I would cook a warm morning feast and break out the champagne glasses for some mimosas and o.j. for the kids. Cheers to winter! The morning was going so well, until mother (that would be me) had her meltdown. Why does this always happen to me.... I had a lovely table set, the bacon was warm, the pancakes were done, the kids were at the table but where was my husband? Ahh... after several attempts to call him (never call... it always ends up in failure), I finally had to march my mad self into the living room and push the power button on the stereo to turn off the loud Mark Knopfler just to let my husband know that breakfast was being served. Maybe, this wasn't the best approach. Argument...upset mother....upset husband....mother stalks off... breakfast still waiting..mother still upset..convinced that my breakfast was ruined... I cried. Mid morning meltdown. Have you ever had those before? 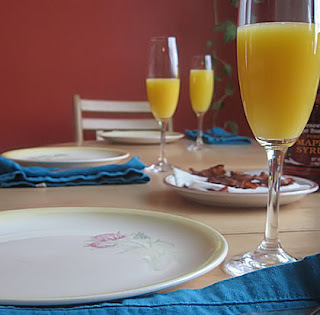 Breakfast finally ensued, husband and wife made up...I drank my mimosa, (two), and ate the pancakes that my daughter cooked up and munched on crispy thin bacon. To satisfy my own curiosity, are you readers out there a thick cut or thin cut bacon person? I have switched back to thin.... for various reasons. I tend to find that the thin is just so much more mouthwatering, like some delicate chip that melts in my mouth with hardly a chew. I digress. It was delicious... even with the meltdown hiccup...the mornings meal was a true welcome to winter. The kiddos went out to play in the fresh snow after breakfast and Hopper went out to shovel. I stayed in my warm kitchen and continued my personal tribute to winter. I embarked on Winter Shortbread Cookies. and drank more champagne. 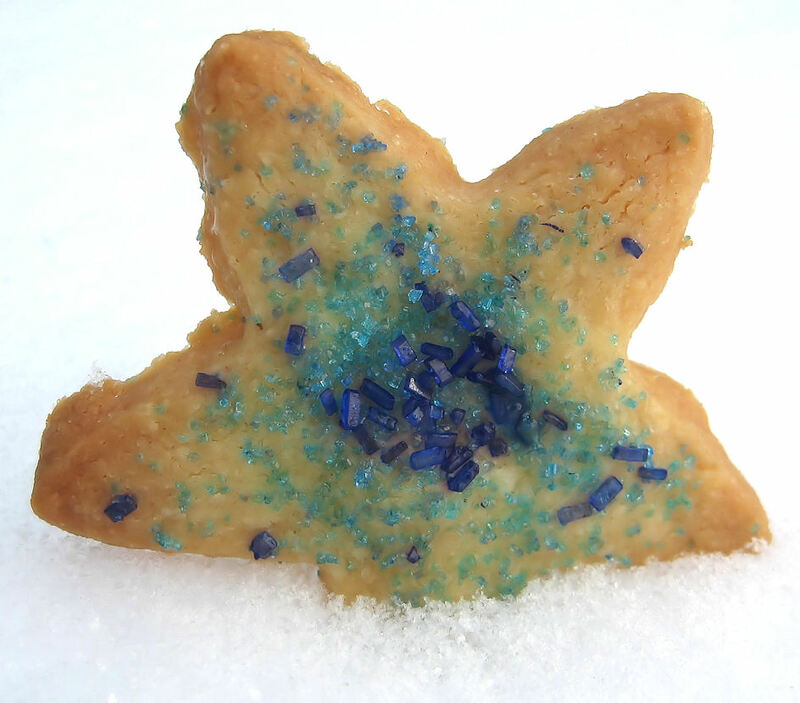 The zen of the snowflakes and buttery shortbread dough put me back in my element. The quiet kitchen filled with peace calmed my heart. 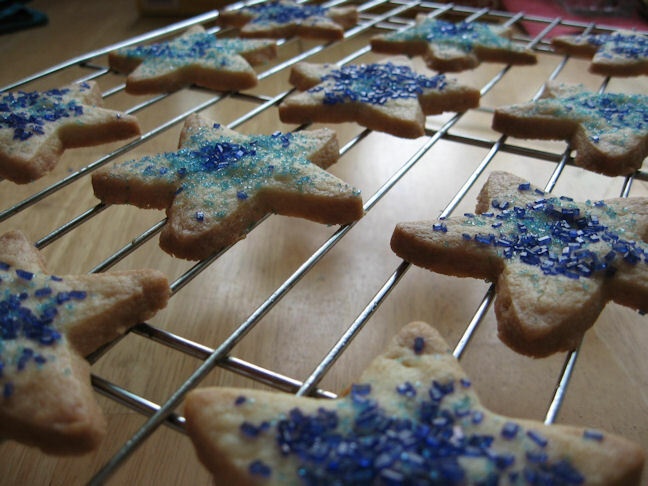 I invited the children back inside when it was time to cut out the shortbreads and decorate them with the amazing blue sanding sugars. 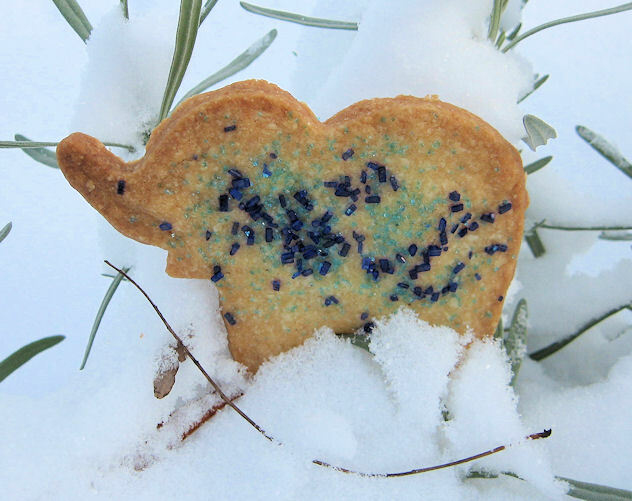 Somehow, some elephants made it into the mix of cookies. I started with pure stars, feeling that they were a tribute to the season but the elephants... hmmm. They turned out beautifully as if they had traveled far and wide to get here. We did have one little elephant escape into the lavender bush. I think he was lost. In one of my 'foodalution' moments, the kind where you obsess about grabbing the right photo, I grabbed my beautiful blue glass stand which was loaded with cookies and went out on the porch to grab a snap shot of these beauties. I figured the blue would stand out so nicely against the white of the snow. Whoops! When I set the plate into the snow.... all the cookies toppled right off into the soft white snow. I think they did it on purpose as they looked like they were having so much fun and didn't seem to mind a bit that their little shortbread bodies were covered with beautiful white snowflakes. Wheee.... that was fun... let's do it again! Decorating sugars. I used sanding sugar and sugar crystals. They do have food dyes in them. 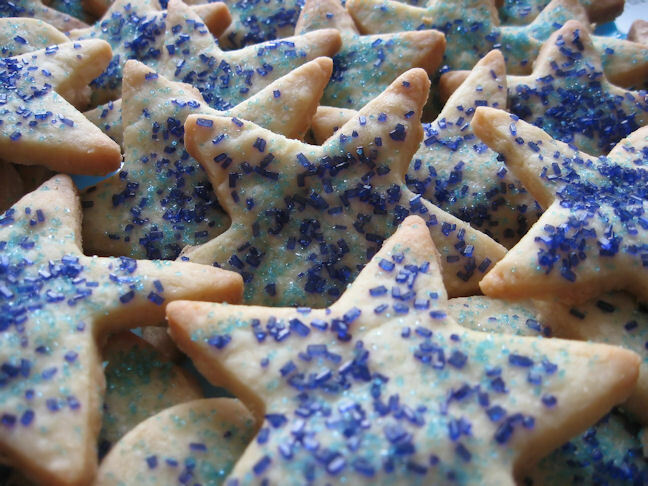 But they added so much sparkle to these buttery cookies. In mixer, blend sugar and butter until creamy. Add vanilla. Add flour and salt. Be sure to scrape your bowl. Mix until the dough just comes together. Place dough onto floured surface. Divide in half. Shape both into discs, cover with plastic warp and refrigerate for 30 minutes. Oven to 350 degrees F.
Take out one of the halves of dough. Flour your work surface Roll out to a 1/4" thickness. Choose your cookie cutter weapon. Cut out cookies. Place onto parchment covered cookie sheet. Decorate. Do not worry about your decorations spilling onto the parchment. Place cookie sheet in freezer for 6 minutes. This firms up the cookies and lets you transfer them onto another cookie sheet covered with a clean sheet of parchment paper. Take out of freezer, transfer to the clean cookie sheet and place in oven until just browned around the edges. Depending on the size of your cookies, this could be anywhere from 10 - 15 minutes. Keep your eye on them. Take out, let cool and enjoy. And thank you to my 100th follower! Hooray! I never thought that day would come. For a while there I was singing the '99 followers on my wall' tune. I remember when I had my first follower (my husband) and how exciting that felt! Then along came Biren, Belinda, Kristy, Chef D as I like to call him (Dennis), Wendy, Othelia and Sara... just to name a few. It snowed here, too, though not as beautiful as what you have! Love your shortbread so festive looking really matching for the coming X'mas theme. Oh my gosh, I thought the first pic was of cookies in white sugar made to look like snow. I didn't realize it was real snow! Such a pretty picture, and the cookies do look like they are having a little frolic. I love the blues you did these shortbread in. A nice change from the reds and greens! So jealous! We only got a dusting! Shortbread looks fab-- nothing beats homemade!! Love the photos! And shortbread cookies...I'd have to say they're probably my favorite this time of year :) Happy Holidays!!! Shortbread is my favorite cookie!! I love your presentation, very cute. I haven't made these cookies in a long time, but what a perfect winter treat. Very cute! NOTHING beats good shortbread! It has been snowing...on and off...since last week.....everything is white and beautiful. The shortbread cookies look adorable! Very pretty cookies. I love how you took picture of them in the snow! Great idea. We haven't gotten any snow yet in Long Island but there were some flurries this morning! Cookies look delicious and gorgeous.. 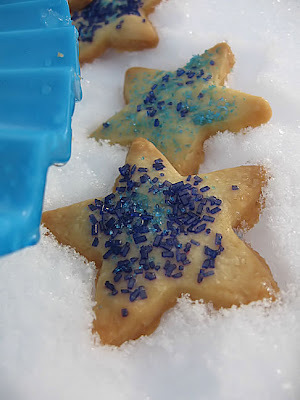 I love the blue-hued sugars on top! 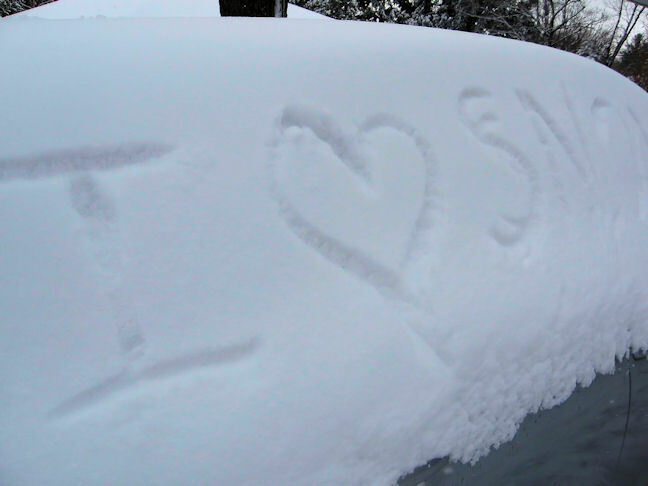 And as for the snow, I envy you so much! The bitter cold without a blanket of white stuff just isn't quite the best recipe for getting in the holiday spirit! 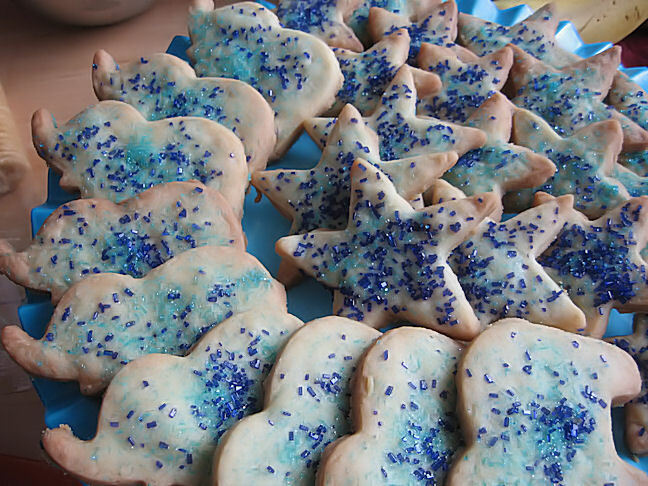 Scrumptious shortbread cookies, I like the blue sprinkles on them! I love the elephant cookie, especially with the blue sprinkles! I have a friend that collects elephants, so this would be perfect for her. 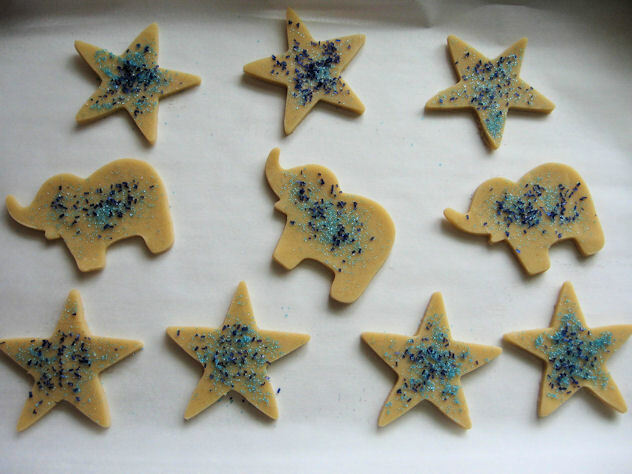 I have to get an elephant cookie cutter! The pictures are so creative! These are a sparkle wonderland of a cookie. We've had snow for almost a month now and I tend to have a bah humbug attitude about it. So pretty but then I won't drive anywhere until the roads are dry. After spinning my wheels in the snow I would love to come home to your dinner (mimosa please and just switched to thick bacon)and then have cookies in the snow. Hahahahaha!!! I love a woman who can admit that she had a mid-morning meltdown! Over breakfast! yes, we are kindrid spirits, we are. Except that I was missing the champagne. Usually I am trying to get my husband off his computer where he is madly fine tuning a djembe video. And breakfast is ready, but the table failed to be set. Hot breakfast, gone cold. Whaaa. How fun and sweet-spirited of a post. Keep it up! Your cookies are lovely! Well, the little stare from your daughter does sound familiar! Mine does exactly that when we made pancakes or eggs. It is difficult to let go sometimes! Imagine when they are ready to spread their wings when that time comes! Gosh! Love the snow! 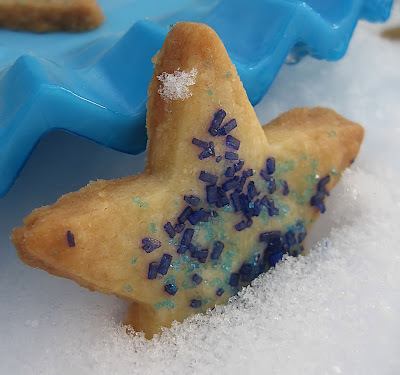 Hope your beautiful shortbread didn't go soggy after it's skate in the snow!!! I love thick rashers (bacon)!